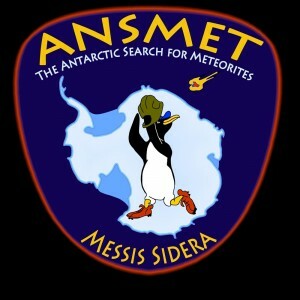 The Antarctic Search for Meteorites program (ANSMET) is a US-led field-based science project that recovers meteorite specimens from Antarctica. Since 1976 we have recovered more than 22,000 specimens from meteorite stranding surfaces along the Transantarctic Mountains. These specimens are a reliable, continuous source of new, non-microscopic extraterrestrial material and support thousands of scientists from around the globs as they seek essential “ground-truth” concerning the materials that make up the asteroids, planets and other bodies of our solar system. The study of ANSMET meteorites has greatly extended our knowledge of the materials and conditions in the primeval nebula from which our solar system was born, revealed the complex and exotic geologic nature of asteroids, and proved, against the conventional wisdom, that some specimens represent planetary materials, delivered to us from the Moon and Mars, free of charge. During its 40+ history the ANSMET program has had three Principal Investigators (PIs). From 1976 to 1995, Prof. William A. Cassidy (of the University of Pittsburgh, above left) served that role. Since 1996, Dr. Ralph P. Harvey (below right, of Case Western Reserve University) has been the PI and in 2016 Dr. Jim Karner (below left, University of Utah) became co-PI. The ANSMET program supports two additional personnel. John Schutt (Dr. Johnny Alpine, above right) has served as ANSMET’s main mountaineer and field safety officer since 1981 and is assisted by 2nd mountaineer Brian Rougeux (left, bottom photo). Both are currently employed half-time by the program. The Antarctic Search for Meteorites program (ANSMET) is a US government-supported activity; simply put, it is supported by you, the taxpayer. Funding for annual fieldwork is supported by competed grants awarded to Case Western Reserve University from NASA while curation and characterization work (at the Johnson Space Center and the National Museum of Natural History) is supported by a partnership between NASA and the Smithsonian Institution. ANSMET has been continuously funded since 1976. Currently ANSMET support comes from NASA’s Near Earth Object program, with funding through the 2021-2022 season. That makes us part of the Planetary Defense Initiative. Don’t worry, we’ll protect you. ANSMET has been called “the poor person’s space mission” because we recover materials from other solar system bodies at a fraction of the cost required by other methods. The cost of ANSMET fieldwork over its entire history still amounts to much less than 1% of a typical sample return imssion. How are ANSMET meteorites distributed? Who owns them? After each field season the newly recovered specimens are shipped (still frozen) to the Antarctic Meteorite laboratory at NASA’s Johnson Space Center in Houston Texas. The samples are thawed and dried and carefully examined both macro- and microscopically. Small chips are broken off of each specimen for initial description by curatorial staff at both JSC and at the Smithsonian. The product of these initial examinations is a short written description, which is subsequently published in the Antarctic Meteorite Newsletter that is distributed to researchers and facilities around the globe twice each year. This newsletter invites interested researchers to request samples for their investigations by submitting requests to the meteorite curators at both the Johnson Space Center and the Smithsonian. The Meteorite Working Group, a peer group established to oversee distribution of samples, helps guide the process. The ANSMET PI’s and field party members do not keep any samples for their own use and do not receive special privileges during subsequent distribution of samples. This is done to guarantee that the scientists who study these rocks can make their own dramatic discoveries. Who makes up ANSMET field parties? How do I volunteer? 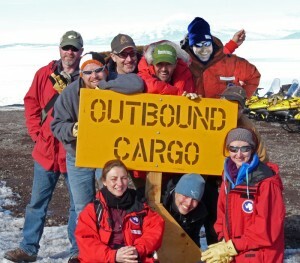 ANSMET is one of the few Antarctic research projects that invites graduate students and senior researchers from other institutions to participate in our field work on a volunteer basis. We do this primarily to help the broader community understand the collection circumstances and the Antarctic history that these meteorites have experienced. Around 200 individuals have participated in ANSMET research throughout its history, some several times. T he first step in volunteering to join us in the field is simply a letter, on paper, stating your interest in the program. Note: I did say paper, didn’t I? consider following that instruction your first test. Your letter will go into a big file that we look through each year, usually in the early spring. The letter should tell me several things. First, make sure you tell me why you want to go, concentrating on the benefits you foresee to your academic achievements (how would it relate to your research?). 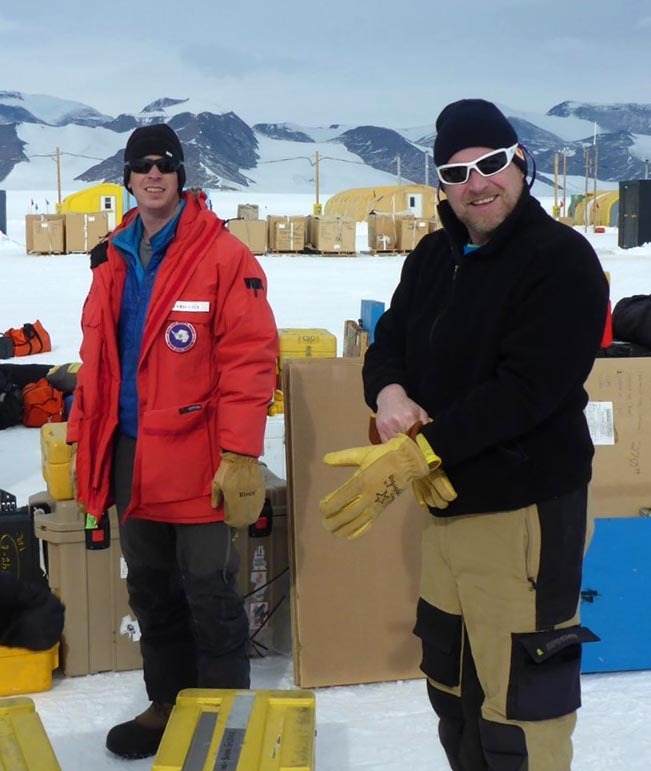 As noted above, we give high priority to those involved in active research with Antarctic meteorites as university researchers or graduate students. Although some level of fitness and outdoor experience is helpful, and sheer enthusiasm is a wonderful thing, we place a much higher value on academic involvement with meteorites or other planetary materials. Make sure you also tell me when you are available, paying particular attention to any academic or job commitments you may have. Just saying “I could go anytime” is not as useful as saying “I will finish my degree in spring of 2021 and would love to go for the 2021-2022 season”. We do not need a CV or 20 of your most famous publications, or photos from your hang-gliding trip in Nepal. Also, be patient. we get a hundred or more volunteers each year, and because most field parties are a mix of ANSMET veterans and newcomers (for safety), only a few new people are likely to be invited each season. Even the most qualified volunteers will probably have to wait several years for an opportunity, so write new letters every year to increase your chances and restate your interest. If possible, introduce yourself to one of us at scientific meetings. Finally, we should note that field party selection is not a democratic process, nor is it “first-come, first-served”. It is ANSMET leadership’s job to construct a field party capable of accomplishing the technical goals of the field work, facing the challenges of the harsh and isolated environment, and maybe even having a little fun along the way. 40+ successful ANSMET field seasons have shown that the fieldwork functions best when the team has a broad variety of skills and experiences, from meteorite science to field work. Creating functional, well-balanced teams is a craft rather than a science, and we take it very seriously. 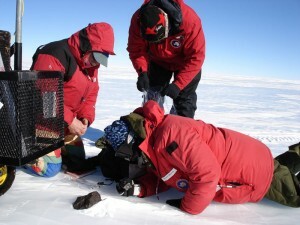 Antarctica is the world’s premier meteorite hunting-ground for two reasons. Although meteorites fall in a random fashion all over the globe, the likelihood of finding a meteorite is enhanced if the background material is plain and the accumulation rate of indigenous sediment is low. 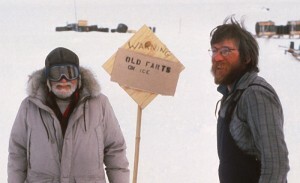 Consequently the East Antarctic icesheet, a desert of ice, provides an ideal background for meteorite recovery- go to the right place, and any rock you find must have fallen from the sky. This allows the recovery of meteorites without bias toward types that look most different from earth rocks (a problem on the inhabited continents) and without bias toward larger sizes. But another factor may be equally important. 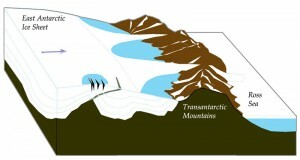 As the East Antarctic icesheet flows toward the margins of the continent, its progress is occassionally blocked by mountains or obstructions below the surface of the ice. In these areas, old deep ice is pushed to the surface and can become stagnant, with very little outflow and consistent, slow inflow. When such places are exposed to strong katabatic winds, massive deflation results, removing large volumes of ice and preventing accumulation of snow while leaving a lag deposit of meteorites on the surface. These areas exhibit a variable balance between infall, iceflow and deflation, all of which are intimately tied to environmental change during recent Antarctic history. Over significant stretches of time (tens or hundreds of thousands of years) phenomenal concentrations of meteorites can develop, as high as 1 per square meter in some locations. Terrestrial exposure ages of meteorites suggest that some stranding surfaces may have even been active for millions of years. How many meteorites has ANSMET found? Why do you need so many? As of the end of 2015 ANSMET has recovered slightly more than 22,000 specimens (the number is inexact because the latest finds are still being characterized, and some may not be meteorites). This represents an average number of recoveries of around 550 per season, although the total for any individual season has varied from 30 to more than 1200 specimens. 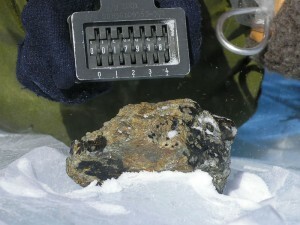 All told, including Japanese, Chinese and European Antarctic meteorite recoveries, over 50,000 specimens have been recovered. That sounds like a lot, but meteoritics is still a young science in a descriptive, explorational phase, and there is a strong scientific demand for new specimens. Meteoritic materials have the potential to reveal the breadth of mineralogical, chemical and textural features present in the inner solar system, but their rarity puts a severe limit on how complete our understanding of the solar system can be. Thus, even though meteorites have been studied scientifically for over 200 years, our understanding of the place of these materials in the history of the solar system is incomplete, containing many large gaps. The best way to fill in these gaps is, of course, to recover more meteorites. About 80-85% of the specimens we find fit within a fairly well known family tree of meteorites (called the ordinary chondrites). they’re still of great interest, given they represent asteroidal bodies that remain only modestly changed from the beginnings of the solar system. But the remaining specimens get the most attention, representing parent bodies that have undergone more complex histories. Sometimes we find something REALLY odd; specimens representing poorly-sampled or previously unknown parent bodies, poorly understood time periods of solar system history, or rarely-seen geological processes. To find these uniquely valuable specimens, ANSMET tries to recover everything that has a chance to be a meteorite. How does ANSMET search for meteorites? The first job of ANSMET is to find meteorite concentrations. Typically this begins when we identify an area of blue ice in a geographical setting that suggests known meteorite concentration mechanisms might be in force (see “Why Antarctica” above). The next step is to actually get some boots on the ice at such a location, look for meteorites and explore the full potential of the site (How productive of a site can it be? How hard will it be to search?). Once a site has passed these tests, more systematic recovery of meteorites can be conducted. Typically that involves sending a fairly large team (6-8 individuals is typical) to conduct searches at that site. A typical field season can last 6 weeks, and some sites may take many seasons to be fully searched. In general, we search in a series of parallel transects- the field party members form a line, spaced approximately 30 m apart, and slowly drive their snowmobiles across the icefield, scanning visually for specimens in their paths. These transects are arranged to provide significant overlap so specimens are unlikely to be missed, and to minimize exposure to uncomfortable crosswinds which affect visibility. Spacing between individual field party members will vary as the concentration of specimens is taken into account, and if the concentration of samples is sufficiently high, snowmobile transects are replaced by foot searching. Training of ANSMET field party members helps ensure consistent recovery methods from year to year. Once a sample is located, we assign it an identification number, establish its position by GPS, take its picture,and make note of its size, possible classification, and any distinguishing features such as shape or fusion crust. The site is typically marked with a temporary flag, and the sample is enclosed within a sterile teflon bag, with care being taken to avoid contact with any mechanical or biological materials. 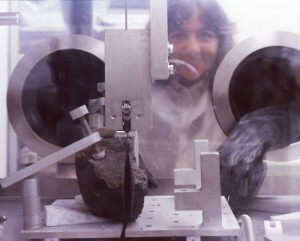 the specimens are then kept frozen until they arrive at NASA’s Johnson Space Center for initial processing and characterization (see “how are ANSMET meteorites distributed” above).